Offered is an interesting early American coin silver teaspoon bearing the maker's mark L&B in large block letters. This piece dates to about 1810-20, and the squared shoulders and style of monogram would fit Philadelphia as well as inland PA, MD and VA. The best fit I can make for this mark is the partnership of Larit (Laret) & Brechemin of Philadelphia, working circa 1816-18; it an attribution based on a sample size of one, but perhaps has a basis. 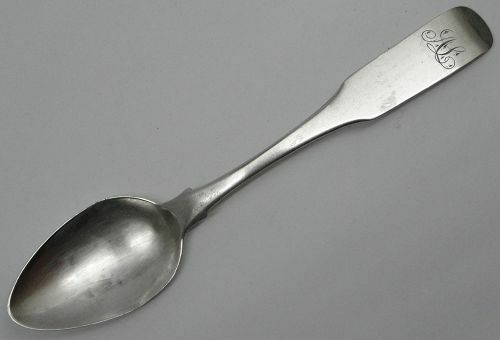 This teaspoon measures about 5 3/8 inches in length and weighs about 11 grams. It is engraved with a period script monogram and the maker's mark is clear. Condition is fair, with a small split to one side of the bowl (see pics), and some surface wear, but no major dents and no repairs. All in all a nice example of this maker's mark!